On Westminster Bridge Road is a new Skyscraper development in London SE1, designed by AHMM, (Allford Hall Monaghan Morris). The architect’s drawings were based on a famous piece of furniture, the Eames Turned Stool giving the building a quirky exterior. Built on the former site of York House, there is now a stunning 19 storey, 62.8 metre high tower, comprising of 1,100 student housing units, including 4,000 sq m of office space, with 65,000 sq m of college/education space, and a 748 sq m health suite encompassing a gym, swimming pool and landscaped gardens with space for 648 bicycles and a café. Urbanest teamed up with education provider Alpha Plus Group who has established and operates DLD College London, which has the capacity for up to 700 pupils, offering state of the art educational facilities and providing specialist teaching in science, IT, art, music and drama. There are a variety of new and innovative room types for the student accommodation coupled with tailor made communal study areas and a common room that will have views across the city from the top floor, whilst offering 5 star facilities. ‘This was a great opportunity for us to show off some of new street furniture range on such a prestigious project’, said John Wilkes Director of Europlanters, ‘Westminster Bridge Road has stunning views of the Palace of Westminster and the London Eye for students to enjoy. 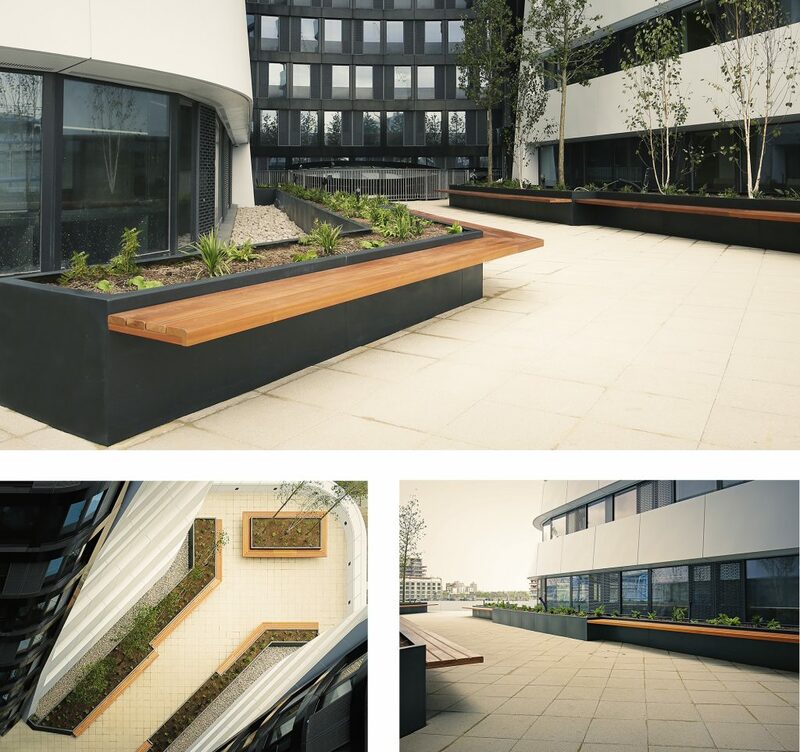 Working closely with Total Protection and Balfour Beaty, Europlanters were privileged to be involved with the planters and street furniture for the landscaping on the 3rd floor terrace and at the front entrance of the building. 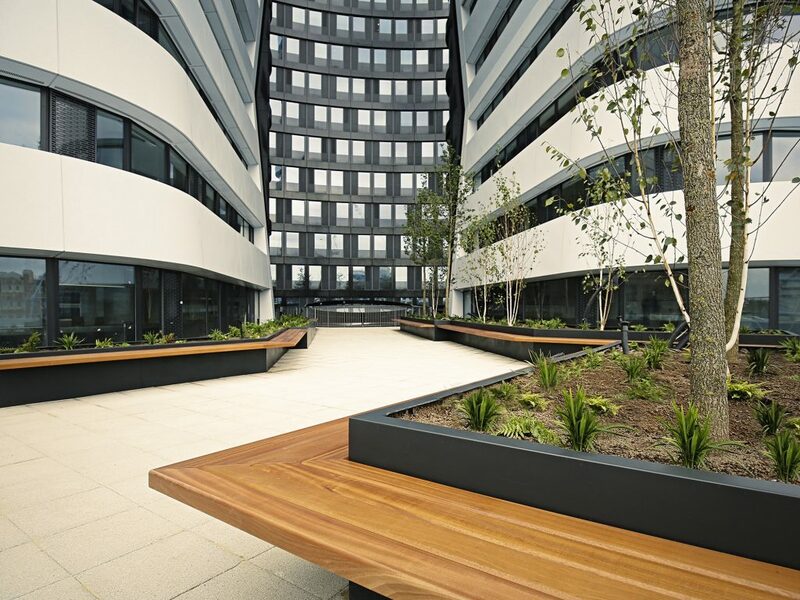 Huge GRP planting beds, some 2000 L/1500 W/690mm H and bespoke triangular planters 2000 L /1507 L /2504 L and 690mm H were designed with over 40 metres of floating seating attached using 148 stainless steel brackets and 180 meters of Sapele timber. 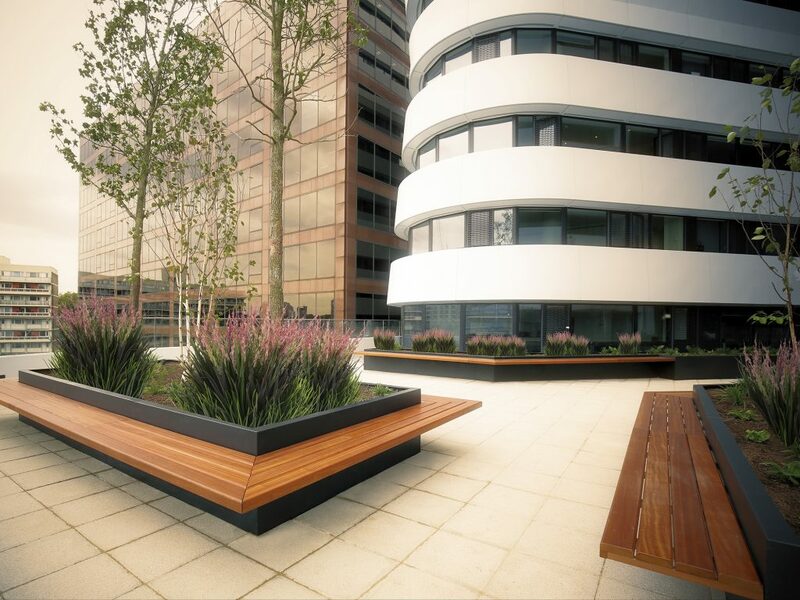 These 35 giant sized GRP planters were used to make the run of seating for students to sit on the roof terrace and a following four supersize planters 2000 L /1507 W/1100mm H were used to make standalone planters at the front of the building, all finished in a Matt RAL 7021 to compliment the buildings steel work. Approximately 21 tonnes of Hydroleca was used and over 65 tonnes of compost to plant up all the planters with large trees and under planting of seasonal plants.